Tides show a slow start to the day, probably chopping in the congestion zone- then prices start to move between 10:30 and 11:30. They stall 1:10-1:50, then move again, with a late countermove. 1. Watch for the opportunity to go with the trend coming out of the 10:30-11:30 timezone. Be alert for the turn coming early or late. Be patient and use the tracking indicators. Plan to trade in the direction of the 110 EXMA coming out of that time frame. Prices should stay on one side of the 110 EXMA and it should be moving, or curl up or down from a flat position. Prices should be within about 2 points of the 110 EXMA. The 20 minute EXMA should have crossed the 110 EXMA, or dipped toward it and then pulled away from it. When this setup is clear, enter in the direction of the 110 EXMA with a 3 point stop. If this setup is not clear by 12:15, skip the trade. 3. 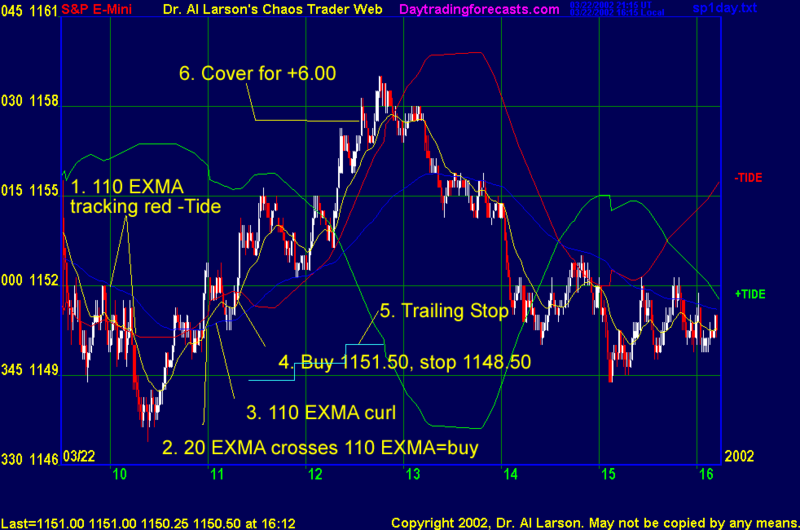 Cover on a 6 point gain, at 1:00, or if the range reaches 17 points, or if the 20 EXMA recrosses the 110 minute EXMA. The chart is annotated with the events as they unfolded in real time. This trade was made live on the Chaos Clinic, with the world watching. It worked to perfection. Not all trades do. You just have to take them one at a time. A few like this one can really help the old equity curve. Again, it was forecast, plan, track, trade.